On Friday I left you all with this little sneak peak about what my weekend was going to be about. As I mentioned on Friday, our front room has gone through a few changes since we bought the house. Recently we sold our old dining room table for $150. So, I was happy to add it back to the room and make a few changes. 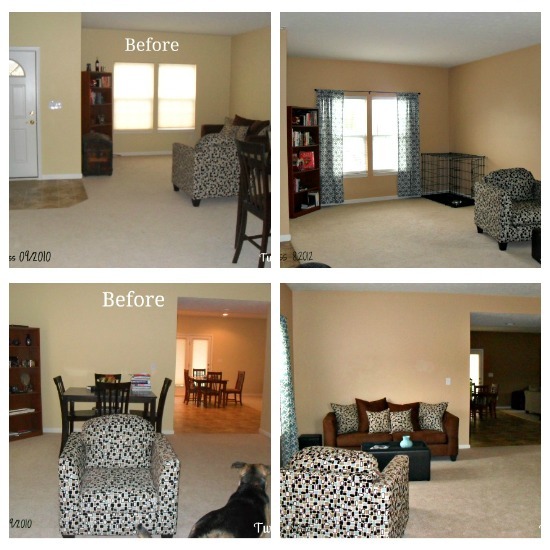 We started by painting the yellow walls with a nice light tan/brown. 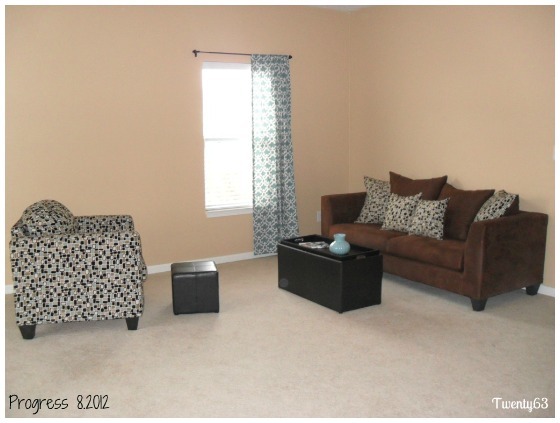 We also used this same color on our fireplace in the living room, it's called Happy Trails by Pittsburgh Paints. We had a half gallon left over from painting the fireplace and the hallway. 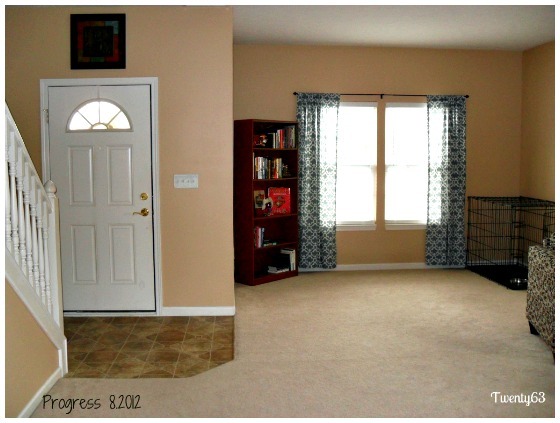 I didn't want to add a totally different color in the front room, I wanted our downstairs to flow. So, we went to Menards, if you're not familiar with Menards they are like a Home Depot and Lowes here in Indiana, and picked up another gallon. After painting we rearranged the furniture. We had two bookcases that were several years old, I took one to work and we kept one for our books. Eventually on the small wall across from the kennel we plan on adding built in bookshelves from floor to ceiling. Above the door I put a dark wood monogram B I picked up at Bed Bath & Beyond several years back. 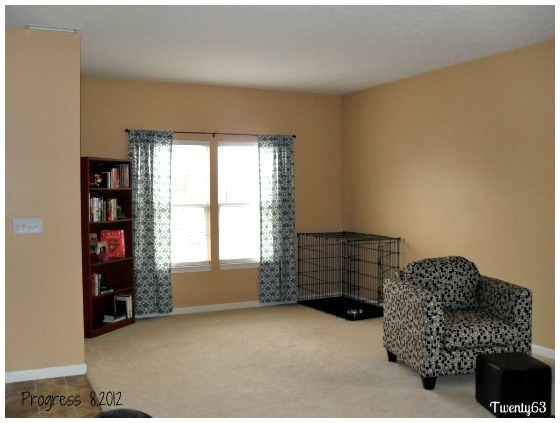 We put our dog kennel in the corner across from the bookcase. Hopefully, this is not a permanent fixture in our front room. However, right now Moby, our newest addition that we rescued, has an anxiety problem when we go to work or leave the house. He will use the bathroom all over the house if we leave him out, but in the kennel during the day he doesn't make a mess. It keeps me sane so it has to stay. The old trunk that use to be next to the bookcase was moved to the living room. I would love to fix some of the broken pieces and have it hold our blankets and floor pillows for downstairs. This furniture we've had for two years. I love it. It has a simple pattern to it, with cream, blue and dark brown. I wanted to pull the blue out so I bought these curtains at Target. I have been stalking them since the beginning of the summer, I couldn't pay $25.00 a panel. I have a hard time paying $100 for curtains since we wanted two panels on each window. But, to my surprise while walking through Target this weekend they were on sale for $16.98 plus 5% off since we have signed up for the Target Red Debit Card. Only $16.13 a panel, I couldn't pass it up! I bought the last four. Once I put them up I realized I only needed one panel on the single window, so I was able to take one back. 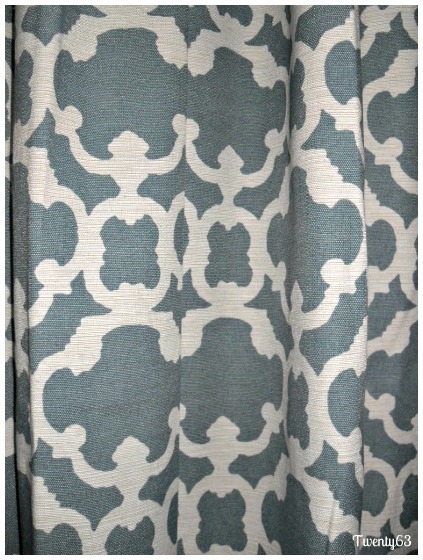 The curtain rods are the same ones in our living room, we bought them at Bed Bath & Beyond. We purchased two with two 20% off coupons. Last year for my birthday the Mr. bought me the storage bench we are using as a table, which came with two of those small ottoman's. The table has a cushion on one side and a hard table top on the other. The blue vase on the table I already had, I purchased it on clearance at Hobby Lobby a few months back. As you can see our downstairs is an open layout, there is our kitchen/living room in the background. Above the sofa I plan on doing a gallery of mirrors but I'm not 100% set yet. Is it just me or do you find it difficult to choose artwork/accessories for a room? I have the hardest time picking out the small things. One day we will get there. 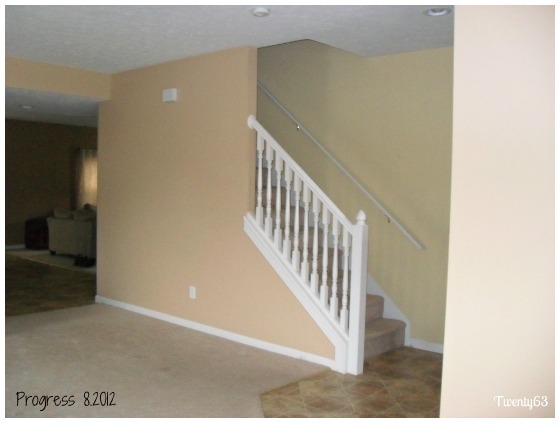 We didn't paint the stair way yet, we will probably paint it the same color. I am currently looking for a buffet, or 6+ drawer dresser to put on this wall next to the stairs. I would love to do a frame gallery above the buffet/dresser. Let's do a little before and after action. Not a huge change, but I think once we add some artwork and a buffet/dresser for some additional storage it will look great. We still $10.63 left over!!! Beautiful work. Keep it up! Looks homey. 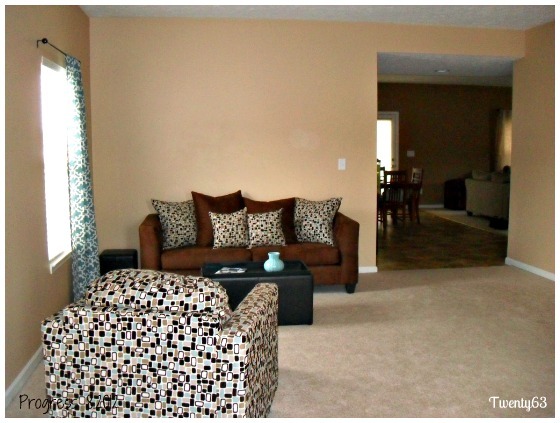 I love the curtains and that print! Such a pretty shade of blue.